The register is the main component of the point of sale side of CellSmart POS. 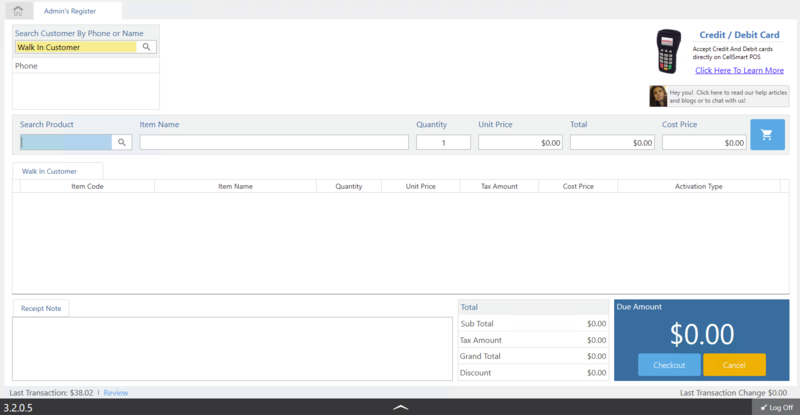 Here you'll be able to start a transaction by adding products to the current invoice. You may also access other features through the main dashboard such as Help, pending tasks, your CellSmart POS account, update log and etc. In the Item code field, enter the name of the product you're going to sell. Select the product from the list provided from the product's window. Click the shopping cart to bring the items to the invoice. Select payment method in the checkout window.